We all have a role to play in the fight against climate change. Your actions, however small, can have a profound impact when combined with thousands of others wanting to make a difference. By being conscious of the choices you make and their effect on the environment, you not only reduce your own carbon footprint but also build demand for more Climate+ policies, practices and products around the world. For a quick fix: Country-specific calculators from WWF allow you to calculate your footprint in just a couple of minutes. If you have an eye for detail: The Carbon Footprint calculator takes in to account detailed information you provide about the things you buy, the utilities you use and your travel choices. Where possible, recycle, re-use, or buy sustainably-produced food and goods. Decrease your energy consumption by turning off lights, and turning down the heat in your home. Try to travel more sustainably, by walking or cycling to work, switching to public transport and reducing airline travel. It would take a whole acre of U.S. forest one year to compensate for your footprint if you flew economy from London, United Kingdom, to Florida, United States, and back. If you can, switch to an electricity tariff supplied by renewable energy sources. Livestock produce a lot of methane, a powerful greenhouse gas, so cut down on the amount of meat you eat in favor of more plant-based diets. Buy locally-sourced, seasonal foods rather than food imported from overseas. Take a look at the WWF website for more tips on how to reduce your environmental impact in daily life. However much we try to reduce our footprint, some emissions are simply unavoidable at this time. 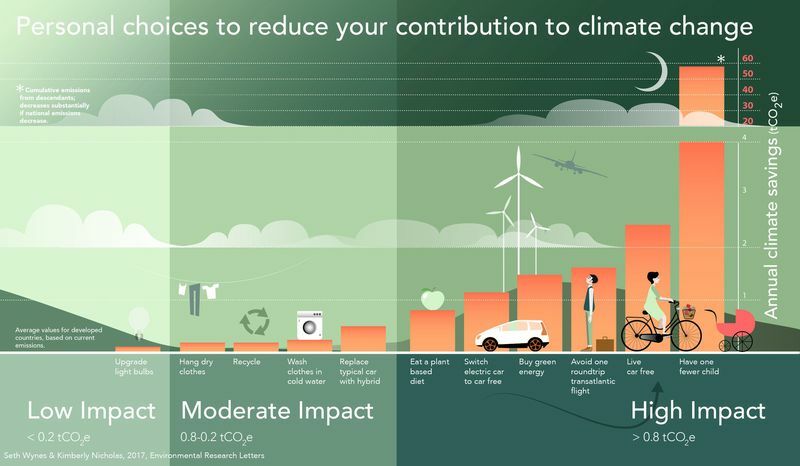 As well as reducing your footprint through lifestyle changes, you take positive action to offset your carbon footprint by supporting climate projects that prevent greenhouse gas emissions or capture CO2 from the atmosphere. Gold Standard was set up by WWF in 2003, to ensure climate projects deliver as much positive impact as possible. As well as helping in the fight against climate change, every project certified by Gold Standard supports sustainable development through added benefits like providing local communities with safe drinking water, protecting endangered species, improving health or creating local jobs. Products bearing the Fairtrade mark meet the international social, environmental, and economic Fairtrade Standards. The Marine Stewardship Council label certifies that fish and fish products which have been responsibly caught. Farms, forests, and tourism businesses with the Rainforest Alliance Certified™ seal have met standards of social and environmental sustainability. These include natural resource conservation, human wellbeing, and climate mitigation. Look at the environmental and ethical policies and record of various companies you support. If you don’t like what you see, don’t support the company. Take a look at RE100, which lists major global businesses that have committed to a goal of operating on 100% renewable electricity. Look out for companies that have set a Science Based Target – pledging to reduce their carbon footprint in line with what scientists say is needed to prevent catastrophic global warming. To see other sustainability commitments companies have made, visit the NAZCA website.